Four straight days of decline from the top of 11,118 pushed Nifty on Tuesday below crucial short-term moving average such as 5/13/20-days exponential moving average, and its long-term average of 200-DMA placed at 10,858. Breadth of the market has been weak for some time now which has kept the upside capped for the index. The index made a recent top on February 7 at 11,118 but since then it has remained in a bear grip. Major indices — Nifty, Nifty500, Nifty-200, Nifty-100, Nifty Midcap, and Smallcap — are all trading below their long-term moving averages. In terms of sectors, Nifty FMCG, Nifty Auto, Nifty Metal, Nifty Pharma, Nifty PSU Bank, Nifty Realty. etc. are all trading below their respective long-term moving averages. 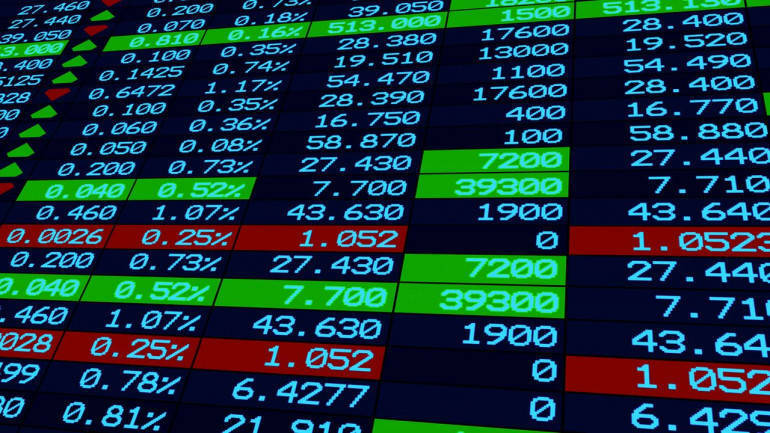 In terms of stocks, nearly 700 scrips on the NSE are trading below their crucial long-term moving averages, including prominent names like ITC, SBI, Maruti Suzuki, ONGC, L&T, Coal India, IOC, Bharti Airtel, NTPC, Hindustan Zinc, Sun Pharma, Power Grid and IndusInd Bank. The use of 200-days moving average is considered as one of the most important indicators by traders and chartists to determine the long-term trend of a stock or an index. Theory suggests that as long as stocks trade above their 200-DMA, the overall trend is considered bullish, while it is exactly the opposite if it is trading below their 200-DMA. The simplest form of a moving average, appropriately known as a simple moving average (SMA), is calculated by taking the arithmetic mean of a given set of values. For the shorter-term simple moving average (SMA), investors can use 5, 13 and 20-day time periods. Whenever prices are closing above the 20 days SMA, it is generally considered that the short-term trend is up and a close below the 20-days SMA, we say the short term trend is down. “For the longer-term, 100 and 200-day time periods can be used. Whenever prices close above the 200-days SMA, the long-term trend is considered to be up and vice-versa,” Shabbir Kayyumi of Narnolia Financial Advisors told Moneycontrol. Only a handful of stocks are taking the market higher while the majority names are still trading below their crucial level long-term moving averages. 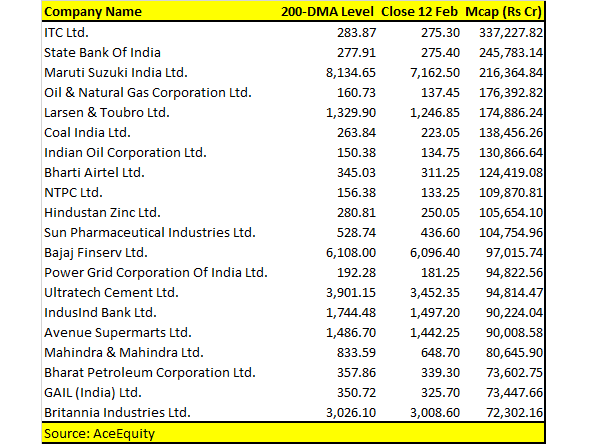 As many as 180 stocks on the NSE are trading above their crucial 200-DMA which include names like RIL, TCS, HDFC Bank, ICICI Bank, Wipro, Bajaj Finance, HCL Technologies, Asian Paints, Nestle India, Tech Mahindra, Aurobindo Pharma, Dr. Reddy’s and Biocon. Moving averages help in identifying the support and resistance levels of security. Resistance makes stock prices go down and builds tension while support buoys a stock up, often setting the stage for a release to new highs. Moving averages such as the 50-DMA, 200-DMA act as both support and resistance. “If a stock is currently trading above its 50-DMA/200-DMA, then these moving averages may act as support to the stock’s price,” Vipin Khare of William O'Neil India told Moneycontrol. “On the contrary, if the stock is trading below its 50-DMA/200-DMA, then they might act as resistance to the stock’s price,” he said. Nifty50 continued its corrective phase for the third session in a row but seems to be attracting some support around 10,850-10,800. The index breached the crucial short-term support zone of the 20-day moving average and the 40-day exponential moving average which shows that bears have an upper hand. Considering the fact that we are trading near crucial support levels, technical charts do not rule out a pullback or some rally from crucial support level but will that sustain is key. Traders who are short can book profits near 10,700, suggest experts. India VIX fell 0.57 percent to 15.75 levels. VIX needs to cool down further with a hold below 16 zones to get any recovery from support zones. On the options front, maximum Put OI is placed at 10,400 followed by 10,700 and 10,500 strikes while maximum Call OI is placed at 11,000 followed by 11,200 strikes. “As long as Nifty sustains above its near-term support level of 10,812, bulls may attempt a pullback rally but the moment Nifty slips below 10,800, the pace of fall shall get aggravated further with initial targets close to 10,700 levels,” Mazhar Mohammad, Chief Strategist – Technical Research &amp; Trading Advisory, Chartviewindia.in told Moneycontrol. “Ideally, if Nifty is making a range bound move between 11,000 and 10,600 the test of lower end of said consolidation zone (10600) can’t be ruled out. However, traders who are on the short side shall consider booking profits close to 10700 levels. Contrary to this any close above 10900 can be an initial sign of come back for bulls,” he said. Gaurav Ratnaparkhi, Senior Technical Analyst, Sharekhan by BNP Paribas said that the hourly chart also reveals that the fall is unfolding with an Impulse structure, which is a typical characteristic of a deeper decline. “On the downside, 10,583-10,534 is the subsequent target area to watch out for. Any attempt of a minor degree bounce is likely to face resistance near 10,900-10,920,” he said.